It may have sped up the cultural evolution of humanity, but on a large and widespread scale it damages the natural world, including animal colonies such as bees, and has created a decline in the nutrient levels of the food it produces. It relies on fossil fuels, such as the oil required for machinery, fertilisers and pesticides. It kills the soil of its life, which includes bacteria, fungi, protozoa, nematodes, arthropods and earthworms. It essentially kills natural systems. Industrial agriculture also requires high input for the associated output. Another important point is that it doesn’t even feed the local population; through free trade agreements food is unnecessarily shipped all over the globe and immorally misses the people who need it most, whilst so much waste is created in the so-called ‘developed’ nations. Industrialised farming simply has to go, for the death of it will be the conscious birth of humanity’s sustainable partnership with planet earth. The transition from inorganic additives to purely organic ones is gaining momentum, but there is still a long way to go. In addition, it is an assumption within the organic food movement that because the fertilizers used are not from made from toxic synthetics, the food is more nutritious. This isn’t necessarily true. Even though organic ingredients are more aligned with the needs of the plant, as well as the soil, it’s ensuring the presence of the organisms that should be living in the soil which will provide the most nutritious food. This is because plants get many of their essential nutrients from the dance they have with the life in the soil. Plants photosynthesize light into exudates (which are mostly sugar mixed with a little protein and carbohydrate) which they pump into the soil to attract specific microorganisms that they feed to create an exact balance of ingredients that they need to be fully healthy. The plant puts out the [signal] it wants to put out that will wake up the right sets of bacteria and fungi to do very specific jobs for that plant. So [for example] the plant needs nitrate, its going to put out an exudate that wakes up those bacteria and fungi that make enzymes that will pull that nitrogen straight out of the crystalline material of the rocks, the sands, the silts, the clays. There is no soil on this planet that lacks the nutrients to grow plants. It’s just utterly ridiculous that we’re going around putting in inorganic fertilisers because your soil already contains all the nutrients that your plants can possibly use. They’re present in that soil. What we’ve destroyed in converting our soil into dirt has been that life that makes those nutrients available back to the plant. The continual ploughing of fields, combined with heavy use of fertilizers, has degraded soils across the world, the research found, with erosion occurring at a pace of up to 100 times greater than the rate of soil formation. When we use inorganic fertilisers, we pour on one, or maybe two, in extreme cases we’ll put three of the nutrients that the plant is going to require, but all the rest of the nutrients are ignored. And everytime we put on an inorganic fertiliser it kills those organisms that will protect your root, that will pull the nutrients into that root zone and store them and keep them there. If we destroy this life we have no way to build structure in the soil and therefore water does not infiltrate into the soil, instead your water runs off and it ends up causing erosion and it causes movement of your soil into your lakes and rivers and streams, destroying water quality. So how do we revitalize our soil on both an individual and community scale? The first step is to be familiarized with the practice of permaculture, which you will learn greatly about in the article ‘Permaculture – Reconnect with Nature, Supply Your Own Resources‘. 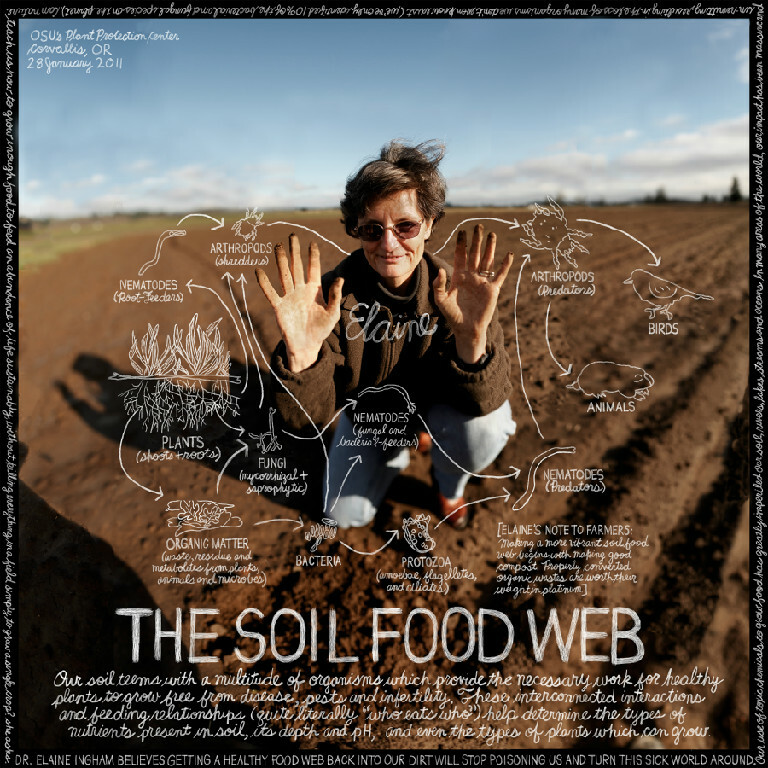 In it the icon of Permaculture, Geoff Lawton, is interviewed. In addition, watch this interview with Elaine for a detailed account of why and how to return to the right balance of life in our soil, plus so much more.